Overrides makes possible change the design of a frontend extension by adding customizations inside the template files. Thanks to Joomla 3 this process is easier. In this tutorial you will learn how to create overrides for core and third party extensions. Basically are custom layouts for Joomla extensions that replace the default ones without modifying the core files. You can change the design of components, modules and sometimes plugins by editing php and html code. 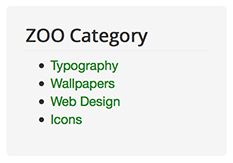 Template overrides are not mandatory if you are satisfied with the design of your website. In the other hand, if you want to achieve a different look for your articles, contact form or other third party extension I highly recommend continue reading this post. How to customize a module? Go to Create overrides tab to see the available extensions. 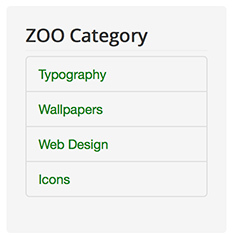 Click on the one you need to override, in this case we choose mod_zoocategory. If you receive an error is probably the override already exist. Go to the new folder from Extensions > Template manager > Templates > Your Template Details and Files. 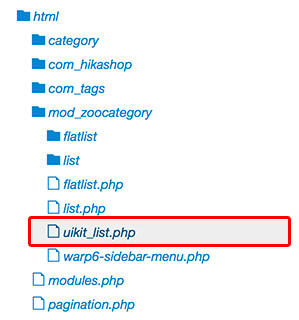 This override folder contain a few php files that represent different module themes, we will edit uikit_list.php. This syntax renders the Zoo category module. We can noticed one of the arguments define CSS classes: uk-list uk-list-line. Let’s replace it with: nav nav-tabs nav-stacked. The classes nav nav-tabs nav-stacked are already included in the CSS files from the template, that's why the design is different and the customization was easy to implement. You can apply overrides to components and modules mainly, the process would be fairly the same. Be aware not all the extensions support overrides and sometimes would be required customize more than one file for a single layout. Read more about template overrides.